A damaged fence is no fun. You’ve just installed a beautiful, new fence. The last thing you want is to immediately need the fence repaired or replaced due to preventable damage. 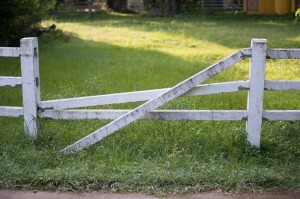 Here are a few steps you can take to save yourself the hassle and expense of fixing a damaged fence. Sometimes, an unstable tree or tree limb will fall on your fence, damaging it. This type of tree damage can be avoided with proper landscape maintenance. If you have trees near your fence, keep an eye on their health. Look for strange bumps, an excess of insects, and discolored leaves. If you notice anything strange about the trees on your property, then contact a tree service for diagnosis and treatment. This will keep the tree from becoming diseased or dying, which makes the tree unstable and easily knocked over by strong winds. Another option is to trim tree branches away from your fence if possible. Seasonal pruning is also a great way to remove dangerous dead branches as well as keep your tree healthy and beautiful. If you notice that your neighbor’s tree is dying, diseased, or has precarious broken limbs, then be sure to tell them right away so that they can take care of the problem. This can prevent extensive damage from falling branches. Do you live in an especially windy area? Then getting a solid wood fence may be a bad idea. Consider instead a chain link fence, a vinyl fence, a wrought iron fence, or a split rail wood fence. These types of fences allow wind to pass through, rather than blocking it. Choosing your type of fence mindfully can prevent it from getting blown over when high winds kick up. If you have a wood fence, then you enjoy extra natural beauty in exchange for constant vigilance against natural elements that can damage your fence. Too much moisture can create the right environment for mold growth, which looks unsightly and jeopardizes the stability of the fence. Trim away shrubs and other plants that are close to the fence and remove dead vegetation that is in contact with the bottom of the fence. This not only decreases the chances of mold growth but it also creates a less hospitable environment for pests such as termites. This entry was posted on Friday, August 26th, 2016 at 8:42 pm. Both comments and pings are currently closed.